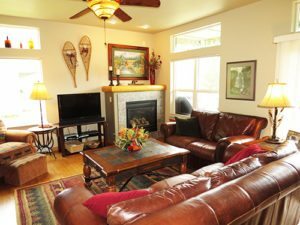 Silverthorne is a little off the beaten path so our properties are larger and most come with extras such as private hot tubs, unique locations and backyard lake, river or trail access. The Blue River, a popular trout stream, flows through the town and past many of our units. 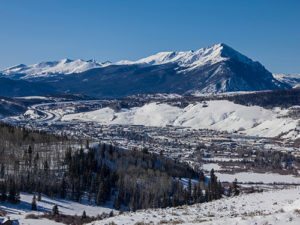 Silverthorne is home to the new Performing Arts Center, the Silverthorne Factory Stores, the Silverthorne Recreation Center (with pool slides) and the renowned Raven Golf Course. It is also the gateway to the Eagles Nest Wilderness trails and has fantastic views of the rugged Gore Range. Our units are located along the Blue River in the valley, near the Raven Golf Course and near North Pond Park. Keystone, Copper Mountain and Loveland mountain resorts are 15-20 minutes. Breckenridge and Arapahoe Basin are 25 minutes. Vail 35-40 minutes and Beaver Creek 45-50 minutes. 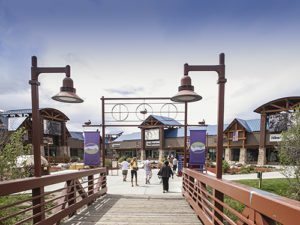 It is just 5 minutes or less to the 40 stores at the Silverthorne Factory Outlets which includes the Colorado Store offering Colorado made products. Target with a fresh grocery is located on the Blue River Parkway. Independent shops, quick service and full service restaurants, a brewpub and liquor stores are also located on or just off the Blue River Parkway. A beautiful multi-use bike and recreation trail runs along the Blue River and connects lodging with the major attractions. Rainbow Park next to the Silverthorne Recreation Center has a playground, tennis courts, basketball courts and a skatepark. The Park also hosts the free Sunset at the Summit Saturday night concert series in July and August. Summer hiking trails in the Eagles Nest and Ptarmigan Wilderness Areas also become snowshoe trails in the winter. Find out from the Dillon Ranger District headquarters on the Blue River Parkway which trails are best. Fun and free activities in the winter include pond ice skating at North Pond Park, a sledding hill plus cross-country and snowshoe trails at the Raven Golf Course, a small sledding hill and playground at the Silverthorne Recreation Center and fly-fishing on the Blue River. Silverthorne is 90 miles west of Denver International Airport on Interstate 70-Exit 205. It is located on the north side of Summit County and is a gateway town for all of Summit County’s outdoor recreation.